Weddings are grand events in the family. It is said marriages are made in Heaven & Customised on Earth! It is said to be one of the most important events in any couple’s life. Every bride keeps on planning for her wedding ideas since years, to make it a picture perfect! The old times have gone when a wedding was just a ceremony where the family-cousins, uncles and aunts managed everything. Now it’s something which is thought and celebrated in a great detail. The days are gone for simple wedding locations. Now-a-day’s people look for an “X Factor” in their wedding ideas. Now-a-day’s people are more attracted towards the Bollywood movies & Television’s soap operas kicks peoples imagination and explore their desire and wants infinitely. They usually observe the Bollywood themes, decorations, home interior, clothes, brides make-up, DJ dances, wedding locations, wedding ideas, wedding themes, etc and try to replicate it down for themselves! Market also promotes all new Bollywood trends very easily with different varieties and options. Therefore, one can also derive some of the wedding ideas from the T.V. shows which gives you the satisfaction of doing something new everyday! 01. The welcome entry gate welcoming guest cannot be more charming & pleasant than this! Alternatively, if you would love to pour-in lots of colours on your wedding locations, have a mix of orange & yellow marigold to decorate your gates/compound wall/balcony, etc. Decorating your house from exterior gives a perfect impression to your guest along with inner happiness that you enjoy and feel blessed! You can give your guests a heavenly & aromatic welcome! 02. Your guests are going to flow-in through this Entrance! Therefore, the doors/ gates should keep-up with the day! 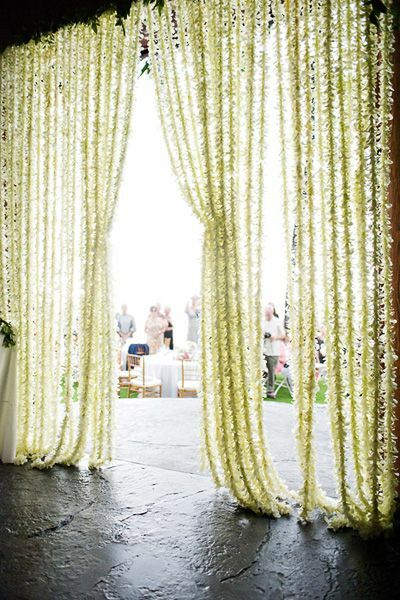 You can curtain your entrance with strings of floral arrangements of White Jasmine/Lilies or Orange/Yellow Marigolds and can also add some roses into it! Along with it you can also use colourful silky- transparent fabrics, fabulously illuminated with varying lights. Of course everything depends on your personal choices & likes! 03. You can also add readymade fountains/big flower vases in the front yard or in the entrance foyer of your house. Enhance the water feature with fresh flowers – floral arrangements of various shades. 04. As per Indian traditions and customs the entrance door should be decorated with torans made up of Ashoka /mango leaves including marigold flowers and other flowers as per different localities and traditions. It is a ritual which everyone does from the poorest to the richest as it is a symbol of a “shubh” – auspicious even at the home! 05. Whether your wedding is during day or night, a wedding location or house can never look dazzling without an infinite amount of illumination. From fairy lights to diyas & candles, series of bulbs, the real mood is always set with the lightings! 06. In your front yard/backyard, you are blessed with trees around your house, don’t forget to dress them up with the lovely floral arrangements. You can also focus it with different lightings, colourful lamps or series of lamps. 07. When there is a wedding in a house, not a single inch of your house goes unoccupied! To give a great ambience to the terrace or the balcony, try having some diyas/bulbs and floral arrangements beautifully in a massive traditional vessel as shown in the figure. With vertical curtains or hangings, the warmness of these diyas gets multiplied! 08. In a real sense, the Indian wedding home decoration is a combination of Indian culture, traditions-customs & encompasses all the senses, which makes it an occasion to remember it for the lifetime! The place for the bride & groom looks graceful with the warm tiny lights brightening up the divan-sofa and the table. Candles & Curtains surrounded with spilled floral arrangements gives a perfect company to the couple. Also Read: Tips for Choosing the Right Chandelier for your Home! 09. 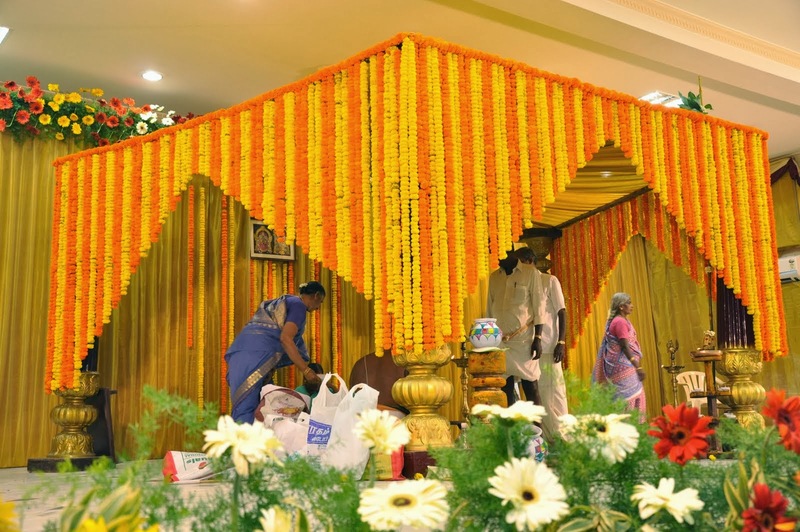 The primary function of wedding ideas involves the mandap. The mandap here has also not shied away from placing decorative matkas. The white background has truly helped to highlight the richness & vibrancy of these colours. If your house size allows you to play with the colours, do not go for a rethinking. Just like the given image, you can host your guests with colourful and fragrant floral arrangements of marigolds, jasmine & roses. 10. You may have a single or double stairs in your home. The house has beautifully adorned the railings of the two stairs that create an arch, dividing the space. 11. The tree in your home front yard/backyard can serve as an excellent space for hanging a swing/jhoola for the couple. If you already have, then spruce it up with the flowers & colourful ribbons with variety of lightings too! If you are doing it especially for the wedding occasion, then use the colourful ropes and stylish seats that blend with the selected wedding themes! 12. Flowers can never be too much for an Indian wedding ideas. You can decorate your backyard with setting of different floral arrangements hanging on a tree as shown in the figure with variety of seatings arrangements for mehndi or any other get-together for your families in your wedding themes! Additionally, the fairy lights can also be wrapped around to dispel any darkness around your house or wedding locations. To give it an auspicious touch, you can tie up the tiny bells at the end of the floral strings. 13. Decorative dishes (thalis) can be an excellent idea to decorate tables for a wedding. The dish (thali) here is laced with golden beads and laces and has cute little candles and beautiful flowers! A table whether inside or out in your courtyard/backyard can steal the show with an appropriate fabric to cover it gracefully. A vase with flower or floral arrangements can be the perfect partner for it! 14. You should ofcourse never forget the main auspicious or shukkan items related to Indian traditions which are considered as “shubh” for Indian families like Shubh-laabh on your entrance door, making Ganesha-swastik on your house threshold/walls, making rangolis in your front yard, decorating god’s sculpture, Decorating diyas with small readymade designs, Grah pravesh for Bride and many more. 15. To give a simpler and softer look, instead of bright roses and marigolds, go for soothing roses you can also the local flowers too! The bulb-like installations containing delicate roses can be hung from the ceiling that is surrounded by lush green creepers. 16. The return gifts for your guests too can serve as a fantastic decorative item like the silk bag shown in a figure. The golden strings and traditional golden borders at the bottom give a classic touch to the gift pouch. If it is likely to rain or you have your wedding in rainy season than you have to plan accordingly-keeping in mind to wind-up your decorations soon or sometimes let it be as it is! Of course there can be infinite wedding ideas & wedding themes based on your likings & culture. Hope these wedding home decoration tips will help you out in sprucing up your house for the biggest day of your life!